With respect to Division of Stone Disease, we provide treatment for stones in the kidney, the urinary bladder and elsewhere in the urinary tract. Urinary stones occur in all parts of the urinary system. 97% of all urinary stones are located in the kidney and the ureter. Only 3% are found in the bladder and the urethra. Composition: Urinary stones are actually bio-minerals. They contain both inorganic and organic substances. There are different types of stones. Calcium oxalate is by far the most common stone constituent and is seen in at least 80% of all stones. Renal Stones: Renal stone disease is an ancient and common affliction of man. Over a 70-year life-span, it is estimated that about 15% of people will develop renal stones. Although very few individuals die as a direct result of stone disease, it does lead to significant suffering from pain, urinary infections, and obstructive damage to the kidneys. Though newer and more effective methods of stone treatment are available, the actual cause of stone formation frequently remains unknown. So recurrence is bound to take place. Formation of Stones: The formation of urinary stones has a multi-factorial origin. Socio-economic, genetic and constitutional factors, diet, drugs, anatomic, functional and metabolic abnormalities – all these factors play a part. A most important fact to note is that when a constituent exceeds the saturation in the urine, it crystallizes. These crystals grow and join together to form a stone. A deficiency of some substances that inhibit the growth and aggregation of crystals in urine will also permit stone formation. Ureteral Stones: are stones that occur in the ureter (the tube through which urine moves from the kidney to the urinary bladder). Bladder Stones are stones that occur in the bladder. Urethral Stones: are stones that occur in the urethra (the urethra is the canal through which urine passes out of the body from the urinary bladder). To Evaluate the Presence of Stones: Preliminary urine analysis followed by an ultrasonography will provide most of the information required. To Study the Actual Kidney Function: An IVU series (special x-rays to image the urinary tract) needs to be performed. Additional Tests: In case of further doubts, additional tests such as isotope renogram, cystoscopy and retrograde studies of the urinary tract, and spiral CT may also be performed. For PCNL: Apart from the routine blood and urine investigations, you will also need an ultrasound scan of the abdomen. 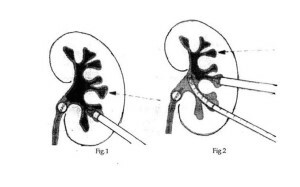 An intravenous urogram (IVU – special x-rays to image the urinary tract) will delineate the anatomy and function of the kidneys, helping to plan the appropriate treatment. Urine cultures are mandatory to detect and treat urinary infection, prior to the procedure. For Patients Suspected to Have Other Metabolic or Endocrine Problems: Detailed testing will have to be conducted. These are generally reserved for those patients who have a recurrent stone formation. Initial treatment will focus upon the relief of pain. After this, the next step will be to facilitate the passage of the stone or the removal of the stone itself. 80-90% of all stones smaller than 5 mm will pass out on their own. If the stone is smooth, even stones of 7-8 mm may pass out on their own. Stones larger than this will invariably need to be removed by one of the many methods available. If there is an anatomical abnormality, the priority will be to correct that abnormality while removing the stone. 1-2 cm solitary stones in the kidney can preferably be treated by ESWL. This is a method by which the stone is powdered when pressure waves from a machine are focused on the stone. The stone fragments will then pass out in the urine stream over a period of 1 to 12 weeks. Larger stones in the kidney are preferably removed by PCNL. In this method, the patient needs to be admitted to the hospital. A small puncture is made from the back directly into the kidney, the stone is identified, fragmented and completely removed. Stones lower down in the urinary tract may be treated either by ESWL or again, by endoscopic methods. In this, the stone is visualized and fragmented by passing a small endoscope into the urinary tract from outside. Open surgery for stones in the ureter is used only in complicated cases. Uric acid stones, which are generally seen only on the ultrasound, and not on the x-rays, if less than 1 cm, can easily be dissolved by simple alkalinization of the urine. High intake of neutral fluids such as water, tender coconut water, diluted buttermilk, citrus juices, etc., is required unless contraindicated for some other reason. Patients should limit the amount of coffee, tea or milk taken to 1-2 cups a day. Food must preferably be vegetarian, and high in fiber. Meat eaters should restrict the amount of meat they eat so that their total protein intake is limited to 1 gram per kilogram per day. Cool drinks and soft drinks that contain a high amount of sugar, and calcium-rich foods such as sweets, sweets made using milk as an ingredient, etc., should be avoided, especially on an empty stomach. Separate and specific changes in the diet may be suggested in the case of other conditions associated with urinary stones. Patients who are suspected to have other metabolic or endocrine problems will need to undergo detailed testing. These are generally reserved for those patients who have the recurrent stone formation. PCNL is a procedure for removing stones in the kidney or the upper ureter. This procedure is commonly performed under general anesthesia, and therefore you also need to be admitted to the hospital for this procedure. In special circumstances, it can be performed under intravenous sedation, regional anaesthesia or local anaesthesia. For the post-operative course, the patient will generally need to stay in the hospital for 2 to 3 days after the procedure. He or she will also undergo additional x-rays or ultrasound studies, to determine if there are any residual stone fragments present. A large amount of residue will require the urologist to look again with a nephroscope to remove it. The other alternative is to treat the remaining fragments with ESWL. From the site of the puncture, the patient will have a drainage tube and a urethral catheter, for a day or two. Following the removal of the flank drainage tube, urine may leak for a day. Post-operatively, the urologist will also encourage a high fluid intake to keep the daily volume of urine produced to more than 2 liters a day. By and large, this procedure is safe. Some risks that can be associated with all surgical procedures are the possibilities of bleeding (1%) and infection, sometimes requiring a blood transfusion. The contraindications to this procedure are bleeding disorders and pregnancy (due to the risk of radiation). The others are medical problems making the patient unsuitable for anaesthesia. It is advisable to maintain a urine output of 2 to 2.5 liters per day. Your doctor may also advise dietary changes and medications, which will be individualized. Generally, a high-fiber diet, with avoidance of high-calorie foods, is recommended.